Although the machinery automation technology and robotics have made significant progress in making production and distribution easy and efficient, there is still a need for manual work such as nursing and other manufacturing work. Those work could possibly cause the work-related disorders. In order to reduce the risk of work-related injury or illness, we have been developing a compact and lightweight wearable robot “Muscle Suit” to provide direct and physical motion supports for assisting human motion. 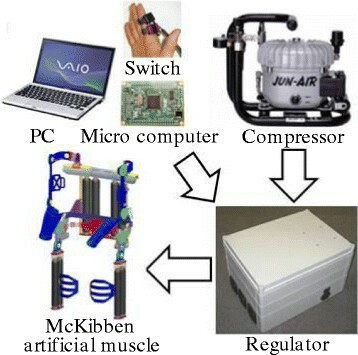 The development of the Muscle Suit becomes possible through the use of the McKibben artificial muscle. This type of artificial muscle has the advantages of being compact, lightweight and reliable. The wearable Muscle Suit has high versatility and conveyance, it supports the user physically with the capability of loading more weights. The evaluation of effectiveness is a key point in the development of the Muscle Suit and it could be estimated by evaluating the muscle fatigue. The evaluation of muscle fatigue is required not only for muscle suit but also for rehabilitation, muscle training and human physical support. Although the frequency transition of electromyogram (EMG) method is generally used for fatigue assessment, it has certain drawbacks depending on conditions and environment. For instance, it is impossible to apply it in the case of isotonic contraction. There are no apparatus or methods which measure muscle fatigue noninvasively and simply. In this study, we used near-infrared spectroscopy (NIRS) to measure the serum oxygenated hemoglobin and deoxygenated hemoglobin concentration of wearer’s muscle indirectly, the new term ΔHbt has been defined and the degree of fatigue has also been evaluated. And then, we had the evaluation experiment of muscle suit using blood oxygenation and the new term ΔHbt to estimate the effects of muscle suit. The European Agency for Safety and Health at Work reports that Musculoskeletal Diseases account for 30% to 46% of all work-related sick leave . Based on USA’s National Institute for Occupational Safety and Health, 67% of nursing care personnel and 84% of automobile factory workers have back pain as work-related disorders . For workers, there are income losses when they are out of work due to work-related disorders. Furthermore, for organizations and factories, the industrial accident compensation is also an unexpected rise in production costs., Thus, we come to a conclusion that work-related disorder is a major and/or serious societal issue. We therefore have been developing the wearable muscle suit - directly support the motion of upper body as shown in Figure 1. The purpose is to provide daily assistance and help users to move unaided. It could also be useful in rehabilitation and aiding manual workers. Use of the McKibben artificial muscle makes muscle suits lightweight and practical. The motivation to develop the muscle suits was originally to support the physically challenged sufferers, although practical use is still difficult with ethical and safety issues. We then decided to apply them to manual workers for solving the problem of work-related disorders. The technology of muscle suits is fairly mature and more than 1000 visitors at the related exhibition have tried it on so far. We then investigate the market research and have been developing the production design. Muscle suit (arm + back support, back support). In the process of development, the evaluation method of muscle suit becomes as important as the development itself. Evaluation of muscle fatigue is required not only for muscle suit but also for rehabilitation, muscle training and human physical support, estimation of muscle fatigue is required. In order to prevent the economic losses such as the compensation of the work-related injuries, the fatigue evaluation for workers is also desired. Although the frequency transition of electromyogram (EMG) method is generally used for fatigue assessment, it has certain drawbacks depending on conditions and environment. For instances, it is impossible to apply in the case of isotonic contraction. Thus, there are no apparatus or methods which measure muscle fatigue noninvasively and simply . We therefore propose a method of muscle fatigue assessment using near-infrared spectroscopy (NIRS) . 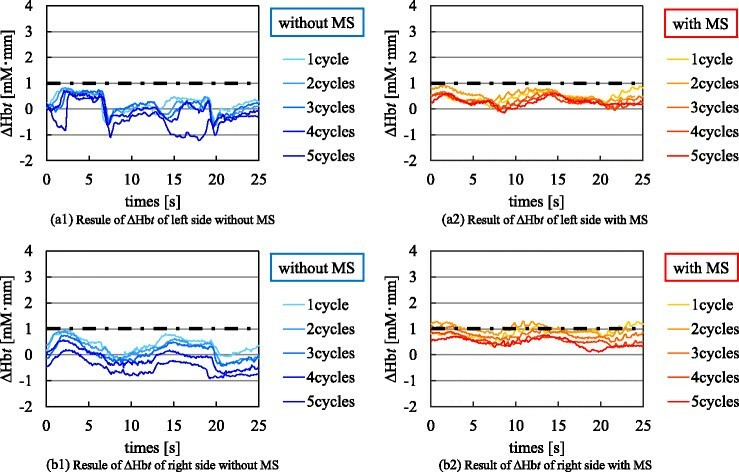 NIRS is a noninvasive optical measurement method of blood oxygenation based on changes in the near-infrared absorption characteristics of hemoglobin (Hb) in vivo due to the state of oxygen bonding. In general, NIRS is used for visualization of brain activity, and several studies have been done on the measurement of blood oxygenation by NIRS -, which indicates the possibility of assessing muscle fatigue using NIRS. However, there is no research so far explaining the relation between blood oxygenation and muscle fatigue directly. In this study, values of oxygenated and deoxygenated hemoglobin obtained by NIRS are employed for muscle fatigue estimation. Under the specific operation, we acquire these values and investigate the relation between muscle fatigue and those values. Then we define the index which seems to represent muscle fatigue using values of oxygenated and deoxygenated hemoglobin. In the paper written by us , we discussed the comparison of ΔHbt of non-state fatigue and exhaustion state in the biceps brachii, and in the other paper , we discussed the comparison of ΔHbt of exhaustion state of low load and exhaustion state of high load in the biceps brachii. And then using the defined index, we have an experiment of the muscle suit, and we discuss the comparison of the change in blood oxygenation with and without muscle suit in the erector spinae. In this paper, muscle suit is introduced in chapter 2, NIRS is explained in chapter 3, index for indicating muscle fatigue is described in chapter 4, muscle fatigue assessment and the experiment of muscle suit is discussed in chapter 5. The McKibben artificial muscle was selected as the muscle suit actuator because of its light weight, simple structure, softness, waterproof finish and power-to-weight ratio . The McKibben actuator was developed in the 1950s and 1960s in artificial-limb research . The McKibben artificial muscle consists an internal bladder surrounded by a braided mesh shell with flexible, non-expandable threads attached at either end. As shown in Figure 2, when the internal bladder is pressurized, air pushes against inner surfaces and the external shell, hence it gets expanding. 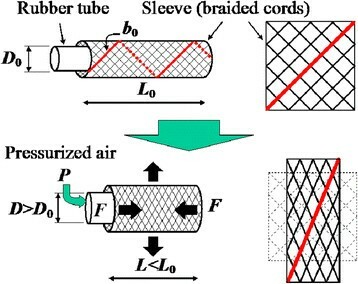 Due to the non-expandability of threads in the braided mesh shell, the actuator is shortened as its volume increases and/or produces a load if it is coupled to a mechanical load. This results in 35% contraction without load and over 5% for a 150 kg load in case of 1.5 inch in diameter (D0). The McKibben actuator requires a compressor, a microprocessor and an electric valve with a pressure sensor, as shown in Figure 3. The electric valve controls compressed air output based on the microprocessor signal. The major drawback is the compressor. However, the factory where the muscle suit is to be used provides compressed air piping, we could use it for the muscle suit by connecting tubing to piping. For use in the home, compressed air could be supplied conceivably by setting-up the piping from the ceiling. As a result, the muscle suit can be made practical. The structure of muscle suit is the exoskeleton type that does not interfere with the movement of the wearer. As shown in Figure 4, the McKibben artificial muscle and the pulley are connected with the wire, and if the McKibben artificial muscle contracts, power will be transmitted to the pulley through the wire. Pulley’s diameter of each joint is 50 mm, and one or two McKibben artificial muscles are connected to each pulley. One McKibben artificial muscle generates torque of 45 Nm. Muscle suit schematics is shown in Figure 5. 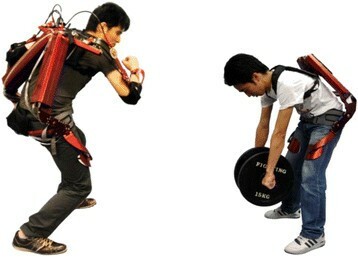 The muscle suit’s mechanical structure must work smoothly with user movement. Assuming shoulder movement has 6 DOF and the center of rotation changes with arm positioning, as a result, the shoulder movement becomes complicated. Thus we developed the special structure enabling shoulder movement as illustrated  using 4 DOF for the shoulder: 3 orthogonal axes for rotation and a slider. Passive sliding follows changes in the center of shoulder rotation. The support torque of shoulders and elbows are 45 Nm, and the waist is 90 Nm. NIRS is a noninvasive method for measuring oxygenation concentration in the blood using near-infrared ray. It was commercialized in 1996  by Hitachi Co. Ltd. basically for showing brain activity and has been used for brain science. 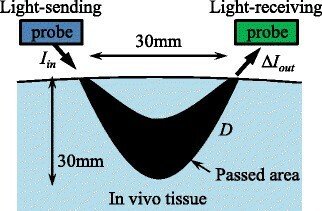 where I in is the light input to the target muscle, I out is the transmitted light pass through the body, D [mm] is the transit distance, ε [1/(mM·mm)] is the extinction coefficientand C [mM] (M: mol) indicates concentration we would like to have. where ΔI out is the change in transmitted light pass through the body, ΔC the change in concentration, D the average optical path lengthand ΔS the change in the scattering effect. Equation (2) is called the Modified Lambert-Beer law. In general, oxygenated hemoglobin gives oxygen to each part of the body including the muscles and then changes into deoxygenated hemoglobin. The deoxygenated hemoglobin obtains oxygen from the lungs and then changes into oxygenated hemoglobin. Note that the total amount of oxygenated hemoglobin + deoxygenated hemoglobin in the whole body should be the constant because the blood flow is constant. If the muscle is used, the oxygen is consumed there, and more oxygen is demanded. As a result, oxygenated hemoglobin is provided to the oxygen-consumed area, the ratio of oxygenated hemoglobin increases and deoxygenated hemoglobin decreases. Thus we may say that by observing oxygenated hemoglobin and deoxygenated one, muscle fatigue can be estimated. In this study, we employed the Spectratech OEG-16 (Spectratech, Inc.)  in order to measure oxygenated and deoxygenated hemoglobin. As mentioned before, two values, i.e., oxygenated hemoglobin (ΔC oxy) and deoxygenated one (ΔC doxy), are necessary to the measurement. Also because D is difficult to acquire, ΔC oxy · D and ΔC doxy · D are calculated using equations below. where I in λ denotes the incident light (wavelength λ) to the body, ΔI out λ the change in transmitted light pass through the body, εoxy λ and εdoxy λ the extinction coefficient of oxyhemoglobin and deoxyhemoglobin. 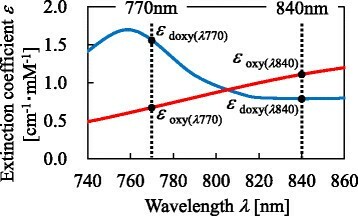 Note that the Spectratech OEG-16 employs 770 nm and 840 nm for λ1 and λ2 which corresponds to 805 nm (where εoxy and εdoxy inverts as shown in Figure 7) ±35 nm selected empirically. 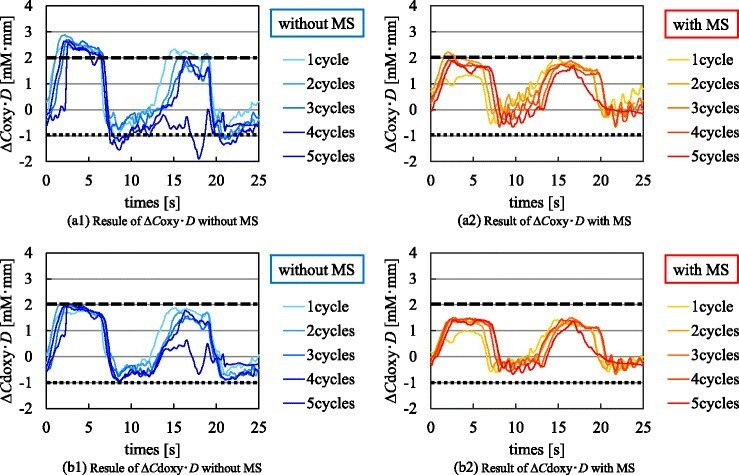 By analyzing the relation between ΔC oxy · D and ΔC doxy · D, we propose the index which seems to represent the muscle fatigue. Following experiments are given approval of International University of Health and Welfare. There are individual differences exist between subjects, such as gender, age, physique, affects blood oxygenation . The straining during operation is called as the Valsalva maneuver and physical exercise before the operation also influences blood oxygenation . We then employ subjects who are the same gender, age, physique, and also ask them to rest 10 minutes before the operation and not to strain during the operation in order to avoid uncertainly factors for blood oxygenation. 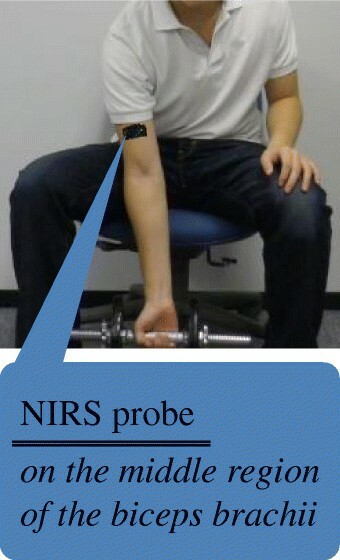 As shown in Figure 8, NIRS probe was attached in the middle area of the biceps brachii. 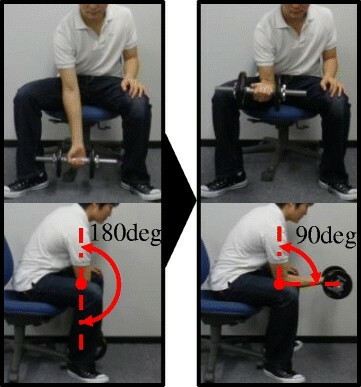 As shown in Figure 9, we request the subject to sit on a chair, hold the dumbbell with the arm extended downward, and then lifts the dumbbell by flexing the elbow to 90 degrees. The experiment consists 3 terms, i.e., 60 seconds rest without holding any object (α), 40 times dumbbell lifting (every 3 seconds. 120 seconds in total) (β), and then 120 seconds rest without holding any object (γ). We apply 2.5 kg and 5.0 kg weights. Four male adults in their 20s (X, Y, V, W) are employed for the experiment. Figure 10 and Figure 11 show the results obtained by subject X for 2.5 kg and 5.0 kg weights. We find that each term, i.e., pre-operation: rest (α; 60 seconds), operation (β; 120 seconds), and post-operation: rest (γ; 120 seconds) are clearly identified. There are no differences at term α between 2.5 kg and 5.0 kg weights. In contrast to term α, there is no similarity in terms of subjects and weights at term β. Whereas when we focus on the difference between ΔC oxy · D and ΔC doxy · D, clear feature is observed, i.e., Figure 11 is bigger than Figure 10 with respect to the difference between ΔC oxy · D and ΔC doxy · D. A similar trend is observed for all other subjects as well. The result of experiment – Load of 2.5 kg × 40 times – (sub. X). The result of experiment – Load of 5.0 kg × 40 times – (sub. X). We then define ΔHbt shown in equation (6) as an index for representing muscle fatigue where t indicated the elapsed time after term β as expressed in Figure 11. In this section, we verify the effects of muscle suit in the scenario of home visit bathing service using back support muscle suit. In home-visit bathing service, the hardest physical work for nursing staff is to carry patients from bed to bath and vice versa as shown in Figure 12. Home-visit bathing service. Source: Asahi sun clean. Co., Ltd. Therefore, we measure the blood oxygenation of erector spinae muscles of nursing staff while they carrying patients from bed to bath as Figure 13 indicates. Lifting movement between bed and bath. The operation of moving patients is performed by two people in cooperation. One is responsible for carrying the lower side of body and the other is in charge of the upper side. The upper side of body accounts for 70% of whole body weight, as a result, the subject in charge of the upper body uses the muscle suit. In this experiment, the height of bed is set to 750 mm, which is an average value of beds using in the actual home-visit bathing service. The distance between bed and bath is set to 900 mm. Furthermore, the height of bath is set to 500 mm as the bath used is the standard type of everyday bathing service. The weight of the user of bathing service is set to 60 kg. Subjects perform the operation carrying the patient from bed to bath, up and down, in 12.5 seconds, similarly, from bath to bed in 12.5 seconds as well. The total 25 seconds operation is considered as one cycle, subjects perform 5 cycles of operation in a row as the prior investigation suggests after 5 times the fatigue reaches the peak value. We then compare blood oxygenation in case of using muscle suit and not using muscle suit. Two home-visit bathing service staffs (A: 25 years of age, 175 cm height, 75 kg weight, B: 43 years of age, 180 cm height, 80 kg weight) are employed. As Figure 14 illustrates, the NIRS probes are attached to the left and right side of erector spinae muscles. First, Figure 15 shows the result of subject A’s right side erector spinae of 5th cycle’s ΔC oxy·D with muscle suit. 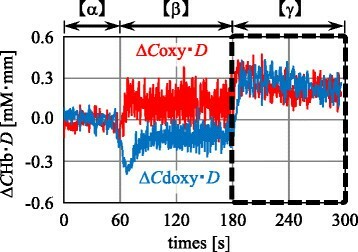 Figure 15 shows changes of ΔC oxy·D during the time of operation. 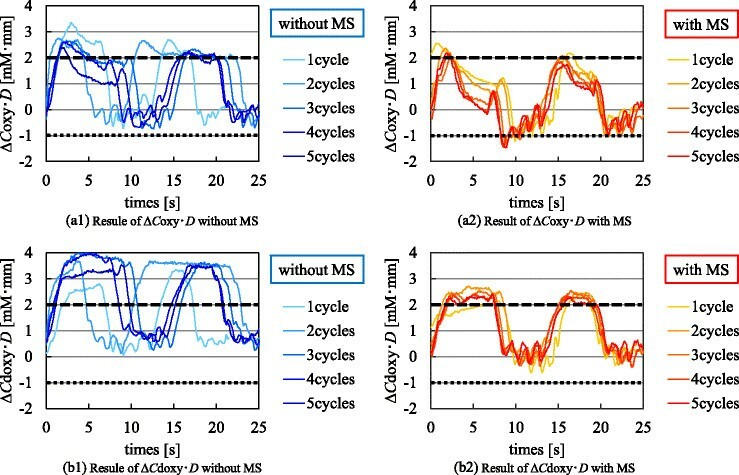 From these results, we can conclude that the changes of ΔC oxy·D fluctuate greatly over the period of time. With the knowledge of this, we then check the results of blood oxygenation of subject A and B. The result of experiment – subject A’s right side erector spinae muscles of 5th cycles (with muscle suit (MS)) –. Figures 16, 17, 18, 19 show the time shift of blood oxygenation, ΔC oxy·D and ΔC doxy·D, of each cycle. Figure 16 and Figure 17 show the results of subject A. From Figure 16a and Figure 17a, there is almost no difference in the change of ΔC oxy·D with or without muscle suit. 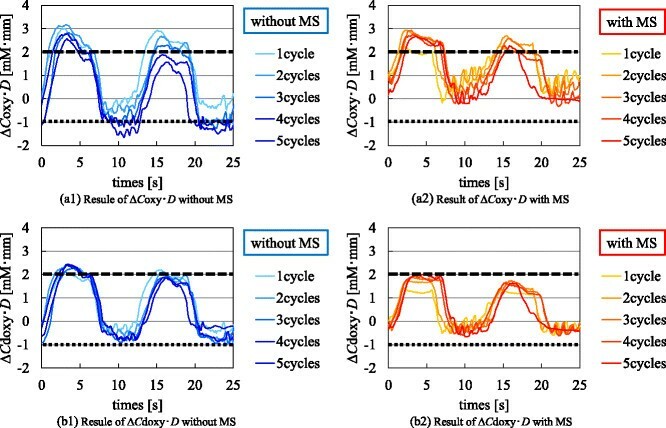 However, from Figure 16b and Figure 17b, the result of ΔC doxy·D without muscle suit is largely positive compared with the result with muscle suit. In particular, the difference is significant in carrying state in Figure 16b. Figure 18 and Figure 19 show the results of subject B. From Figure 18a and Figure 19a the result of ΔC oxy·D in case of without muscle suit during interval is largely negative compared with the result with muscle suit. 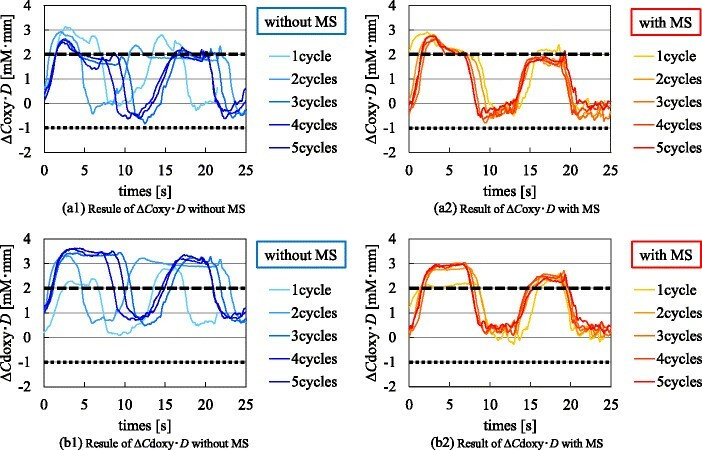 And from Figure 18b and Figure 19b, there is almost no difference in the change of ΔC doxy·D with or without muscle suit. The result of experiment – Erector spinae muscles of left – (sub. A). The result of experiment – Erector spinae muscles of right – (sub. A). The result of experiment – Erector spinae muscles of left – (sub. B). The result of experiment – Erector spinae muscles of right – (sub. B). In conclusion, the change in blood oxygenation with or without muscle suit may vary between subjects, but it is clear that there is a difference in blood oxygenation due to the occupying of muscle suit. Particularly, to analyze the results by using ΔHbt shown in Figure 20 and Figure 21, we can see that the trend of ΔHbt during carrying operation between bed and bath without muscle suit is large negatively compared with the result with muscle suit. In addition, with the knowledge that Figure 20a is a special case, we can see that the trend of ΔHbt with muscle suit is changing gradually compared with the result without muscle suit. 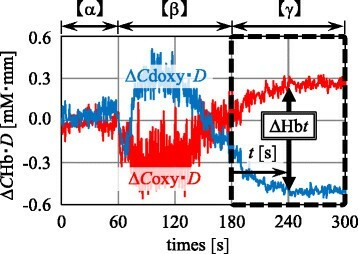 Here, as for the result of Figure 20a, comparing the results of ΔC oxy·D in Figure 16 and in Figures 17, 18, 19, we can see that the fluctuation of ΔC oxy·D in Figure 16a2 is large. It is clear that there is a difference between the change in Figure 16a2 and in Figures 17, 18, 19. The reason for this may be the different ways of occupying muscles when subject doing the operation. The result of experiment – Erector spinae muscles – (sub. A). The result of experiment – Erector spinae muscles – (sub. B). 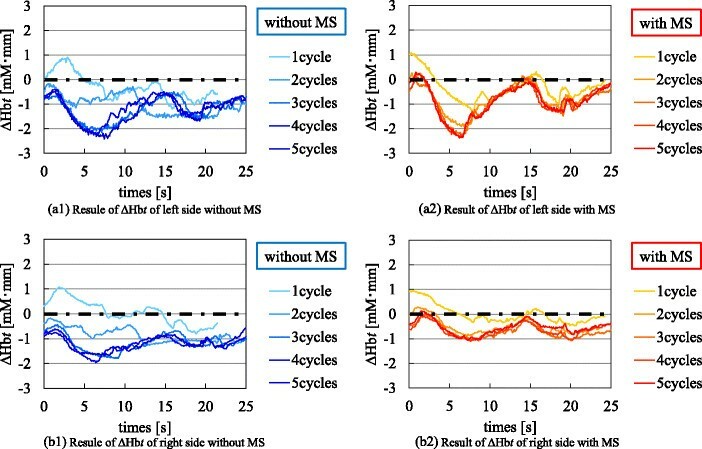 We have proposed a new method for evaluating local muscle fatigue using NIRS. We focus on the change in oxygenated and deoxygenated hemoglobin under the operation and define ΔHbt as the differences between them. In the experiment, as for the muscle of biceps brachii, we find that ΔHbt is constant in case of non-fatigue. Whereas in case of exhaustion, it increases according to elapsed time and shifts upward following with cycles. We conducted an investigation of blood oxygenation during carrying operation between bed and bath in home-visit bathing service. It can therefore be concluded that there is the difference in blood oxygenation by occupying muscle suit or not. In addition, not only the measurement of blood oxygenation after operation but also during the operation could possibly be evaluated in real time to assess the muscle fatigue. The evaluation method of NIRS could be used in further research of assessing the effects of using muscle suit. 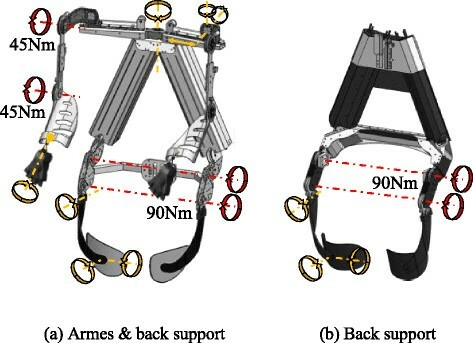 Investigation of local muscle fatigue assessments by NIRS will continue, and adaptation to various scenes require assessment of muscle fatigue such as medical treatment, welfare, the work place and evaluation of muscle suit will be considered. Prof. HK is responsible for research of the muscle suit. YM carried out experiments in this paper and drafted the manuscript. Both authors read and approved the final manuscript.